Edmond De Bergerac tickets at Richmond Theatre, London. 2019. Find the best Edmond De Bergerac play tickets at Richmond Theatre, Outer London. December 1897, Paris. Playwright Edmond Rostand is approaching his thirtieth birthday with no new plays but a whole lot of worries. He has not written anything in two years and in desperation has promised a new play to the acting superstar, Constant Coquelin. A desperate Edmond draws on his problems to write a new comedy. It will be an unbelievable tale about the demands of his producers, the whims of the actresses, the jealousy of his wife, his doubting colleagues and the romantic adventures of his best friend. It shall be called Cyrano de Bergerac! 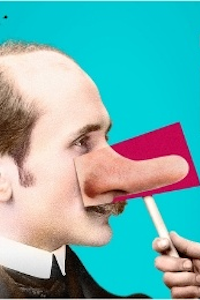 Meet the man behind the nose! Inspired by the story of Cyrano de Bergerac, Edmond De Bergerac took France by storm and now makes its English-language premiere at The REP. Performers Freddie Fox (Edmond Rostand), Henry Goodman (Constant Coquelin), Josie Lawrence (Sarah Bernhardt), Chizzy Akudolu (Maria), Delroy Atkinson (Monsieur Honore), Gina Bramhill (Jeanne), Nick Cavaliere (Ange Floury), Simon Gregor (Marcel), Harry Kershaw (Jean), David Langham (George Feydeau), Robin Morrissey (Leo), Sarah Ridgeway (Rosemonde). Author Alexis Michalik. Producer Birmingham Repertory Theatre. Producer Adam Blanshay Productions. Translation Jeremy Sams. Director Roxana Silbert. Lighting Rick Fisher. Design Robert Innes Hopkins. Director Liam Steel (movement). Music Dave Price. Sound Dan Hoole. Other Stephen Kemble (voice direction). Director Amy Ball (casting director). Edmond De Bergerac tickets: The tabs above allow you to select between links to suppliers and date searching. Click on a supplier's logo to see their details and on the 'buy now' button to see and check the tickets on offer.